West Palm Beach, FL – From June through October 2017, an average of 51.64 inches of rain fell District-wide, a record for wet season rainfall. The previous record for this five-month period was set in 1947 when hurricanes caused widespread flooding that led to the formation of the Central and Southern Florida Flood Control District, the predecessor to the South Water Management District (SFWMD). This tremendous amount of rainfall inundated the three water conservation areas and impacted the wildlife that call these natural areas home. 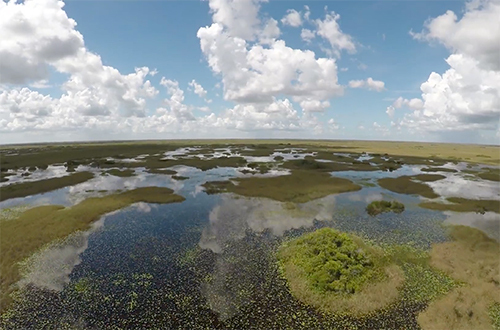 Since June, the District has been aggressive in its quest to protect the Everglades ecosystem and wildlife by moving water south and out of the water conservation areas. "We are doing everything possible, despite the constraints placed on the flood control system in that area, to lower the water levels in the conservation areas as fast as possible to eliminate the risk of impacts on wildlife," said SFWMD Executive Director Ernie Marks. "We would also like to thank Florida Fish and Wildlife Conservation Commissioner Ron Bergeron for everything he has done to draw attention to this crisis."